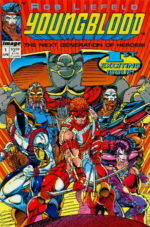 Rob Liefeld’s Youngblood debuted 1987 as a backup feature in Megaton: Explosion, and was to star in their own comic before Megaton went out of business. When Liefeld launched Image Comics with six friends he brought Yongblood with him. Youngblood #1 was the first Image Comics publication. At the time of its release, Youngblood #1 was the highest selling independent comic book ever published. Youngblood was a high-profile superteam sanctioned and overseen by the United States government. 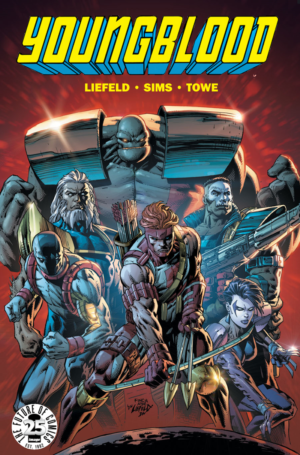 Youngblood’s members include Shaft, a former FBI agent whose archer’s bow uses magnets to propel arrows instead of a bow string; Badrock, a teenager transformed into a living block of stone; Vogue, a Russian fashion model with purple-and-chalk-white skin; and Chapel, a government assassin. Later this year Rob Liefeld will be bringing Youngblood back as part of Image Comics 25th Anniversary Celebration. The series will be written by Liefeld and Chris Sims, with art by Jim Towe. To the right is a variant cover by David Finch it is a direct homage of the original cover of the first Youngblood #1.